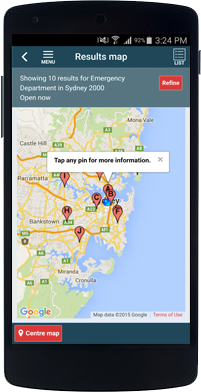 The healthdirect app includes an Australia-wide directory covering a range of health services. Easily find the health service you need, when you need it, their contact details and directions from your current location. All information in the healthdirect app is sourced from Australia’s leading health organisations and has undergone a quality assurance process so people can be assured it is safe, appropriate and relevant for Australians. The healthdirect app can be used in emergency situations. It will display latitude and longitude coordinates which you can relay to emergency service operators when you don’t know exactly where you are. Great health app! I have used this service via the internet platform for quite a few months now. I have now jumped on the new app. Having multiple chronic medical conditions, coupled with severe disabilities, now living alone, it is very reassuring knowing that whatever health service I need, or just for advice at whatever hour of the day or night, 7 days, it's all a few key strokes away, Australia-wide — Well done!